Take your heart medicine, ‘cause this is gonna send your blood pressure through the roof! 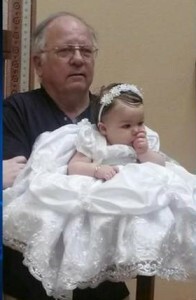 On November 24th…three days before Thanksgiving…29-year-old Galina Kilova ran down and killed a man who was walking his granddaughter on the shoulder of Rainbow Boulevard in Las Vegas. It was a hit-and-run. The POS didn’t bother to stop to see if the man or the 18-month-old baby, Brooke, were OK.
After media stories of the roadside slaughter, Killer Kilova lawyered-up and had her attorney tell police she was going to turn herself in. But not until after Thanksgiving. That would be the same Thanksgiving that the man she plowed over, Michael Grubbs, wouldn’t be spending with his granddaughter and the rest of his family. Maybe she just needed the time to sober up. Guess we’ll never know now, will we? Wait, here comes the punchline…or rather, the punch in the gut line. Why do you think Killer Kilova didn’t have a valid driver’s license? Because, we learned on Friday, she’s an ILLEGAL ALIEN! And back in 2007 Nevada didn’t give driver’s licenses to illegal aliens. Which raises the natural question: Why wasn’t she deported immediately after she was caught? According to press reports, Killer Kilova entered the U.S. in 2006 on a six-month, non-immigrant visa. But instead of leaving when her six months were up, she stayed. Illegally. She was picked up, drunk and driving, just a few months after her visa expired. I mean, it wasn’t like she’d been here for 20 or 30 years with a family and kids and grandkids. You know, like Mr. Grubbs. Instead, this illegal alien killer was allowed to remain living among us. Did Killer Kilova have one of those new “driver authorization cards” the Legislature authorized last session (SB303) for illegal aliens? If so, how’d that work out for Mr. Grubbs and his granddaughter? If not, why not? Passage of that bill was supposed to take these illegal alien drivers and get them licensed and insured. If Killer Kilova didn’t comply, what’s that say about this feel-good bill? But wait, this story gets even worse. By the way, nobody knows what Ms. Killer Kilova’s nationality is, so don’t give me any of this crap that this is all just anti-Hispanic racial hatred. Her nationality is irrelevant. I couldn’t care less. Fact is she didn’t belong here. She broke our laws. She should have been deported 7 years ago. If she had, Little Brooke would still have her grandfather to take her for stroller walks today. Do we need immigration reform? Damn straight. But not the kind of immigration reform where we excuse violations of our immigration laws and, unbelievably, give illegal aliens driver’s licenses. The Nevada Legislature should repeal SB303 next year. Call it “Brooke’s Law.” It won’t bring the little girl’s grandfather back, but it might stop another illegal alien from killing somebody else’s grandfather.